This “gorgeous working running quarter horse farm” includes a 36-stall mare motel with 4 foaling stalls, complete vet lab, and stocks for mares with foals. Indoor arena with center swinging divider, roping chutes, screens. an additional outdoor arena with chutes, covered round pen, outdoor covered 120' round working pen, , excellent cattle holding facilities all convenient to pastures and barns. 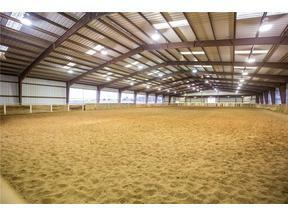 In addition is a 10 stall stallion/training barn with wash rack and tack room. The owner has nothing to worry about as this 96.5 acre property also includes a ranch style 2 story home with 4 bedrooms 3 bath, study, converted garage into large entertaining area with bar.